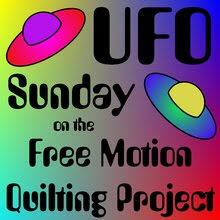 Finish that final UFO and go mad with free motion quilting at the same time. Well the 4th compass is completed. I started really well, enjoying everything, even the challenge of using a thread that will really show up on the curves for my pebbling. I still like pebbling but I noticed that if I do more then 30 minutes then I get careless and "just get it done" syndrome comes into play. So all went well until it came to the white points. I'd looked at loads of the 365 Designs and couldn't find a design like Leah Day's Channel Weave that I liked as well from the straight line ones and then decided to do Leah Day's Flame Stitch to make it look as if Sun Rays were coming out of the compass. I started cheerfully enough, tried the first one in one direction and the second in the other and decided that it was too busy for this part of the quilt so decided to adjust the design and do one big flame and echo coming in and as I started I just lost oomph! It all became blah and tiresome and suddenly I was totally tired and bored with this monstrous quilt and I knew I was facing the huge compass where the design is very important and I can't get away with just trying stuff as I've done in the smaller compasses. I sat and stared and was within an inch away, no make that a seam allowance away, from bundling up the quilt and getting out the bits I've cut for a new quilt and start piecing. And normally that would be a good idea, have a break, get productive on something else while the batteries recharge. BUT this is a UFO and yes I know technically that it is now a WIP and I have no more UFO's piling up, this quilt has been sandwiched for over a year and I know I have to get it done. I tried several ideas in my mind, I could just stipple the rest of it or straight line quilt it, boring but quick, I could use those idea's I had in another quilt one day. But I knew that this was a cop out and actually I'm really looking forward to quilting the white but the Big Mama Compass is in the way. I also thought well leave the Mama til the end but that seems like another cop out and I think would haunt the rest of the quilting. It being too early to reach for quilter's helper (wine), I told myself to do just one more section in my revised flame design. I wasn't any more happy with the result but it was quick. So I did another, and another and finished. There wasn't a huge Woo Hoo but there was a sense of accomplishment. 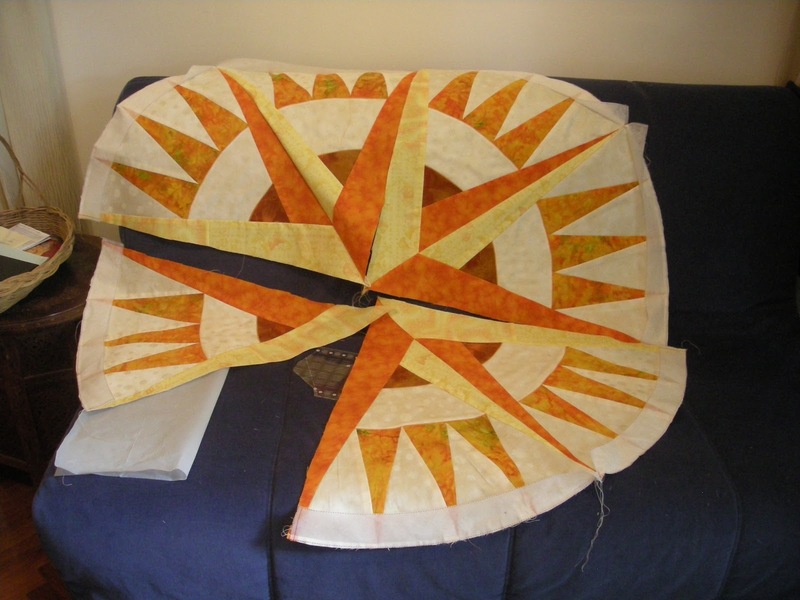 And having finished I realised that what I was dreading was the sewing of the big compass. I have no idea's for design and worry I'm going to choose something that is awful and that piece is just too big to randomly try something/anything. I'm definitely going to do pebbling in the curves as with the other compasses and I'm very comfortable with that design choice. But........... the rest. So I'm reaching out here, please, please, please send me ideas, suggestions because I know that if I get stuck after the pebbling this UFO is going to go back into the trunk for another long while. Note that this compass is 47" and is a monster in itself. It has the same writing on the large cardinal points at the others. Those I stippled in large and small but I have a feeling on these it will seem a bit bland. The Monster that is causing me sleepless nights! I've also figured out that the smudge on my camera is not due to my finger but something on/in the lens, cleaning doesn't work so off the camera shop for me. There are so many beautiful designs we have been working with that will work with this. I suggestion that you do the largest parts, the whites in the compass, with your favorite design to quilt. That is the problem so many beautiful designs, like being is a sweet shop, I'll have some of them and some of them and some of them. But I think you are on to something - choose something I like and stop bothering about whether it will "fit". If it were me quilting this, I would use a combination of Leah's Ocean Current and Swirling Water, making the center compass the 'island' with the current flowing around it and then the swirling water 'washing up' on the shores of the other compasses. I ran across another blog that I thought you might like to look at, I realize the whole idea here is to FMQ, but as you say this is a LARGE quilt, this might be really difficult to FMQ. But why not use a walking foot and get a little nuts with it? 'No more UFOs'? Compare with my 20! And your work is amazing! Oh Gosh (a bit flustered with the praise here). Thank you. Took me a year to get to this point of this being my last UFO and the temptation is always there to start another quilt before this is finished so I BAD GIRL myself a bit and push on. I LOVE what you did in the white between the compass spokes! It looks perfectly suited there. I have a flimsy with 24 big compasses on it (18" square each) that I've been struggling to figure out what to do so I'm always interested in other ideas. You've done well so far! Hope mine turns out as pretty. Did you say 24 x 18" compasses? Fainting here. I don't know what a flimsy is but would love to see a photo. Nice to have someone else with a compass in their life. Is this seriously your last UFO?! That's amazing! (ps- the FMQ looks amazing so far as well). I always just go through all of the 365 designs until I find one that I find interesting, so that's probably not much help. Yup the last UFO in my list. I'm not counting the 3 king sized douvet covers I bought in Laos two years ago that I've always intended to put batting in a quilt. They do stunning handwork there. You are the second person to hint/advise to just find a design I like and not worry about what "fits" if you see what I mean and I think I'm going to go with that. I think the compass rays would look great with chevrons--it might emphasize a 3-D look. Not sure if that's clear....I'm thinking a series of / echoed on the light sides and \ echoed on the dark sides of the eight main compass points. The inner brown circle could be wood, so possibly a bark/woodgrain-type pattern around that inner circle. In the smaller orange compass points, possibly echo a minaret type shape (pointing out), and I love Christina's idea of the water swirls for the rest. There's no "right" answer, of course, except the ideas that appeal most to you. Some good idea's Karen thanks, will draw them out and have a feel for how that fits. B, your work is beautiful, and I CANNOT believe this is your only UFO. I say make a black and white sketch of your large compass, make a bunch of photocopies, and start doodling! Your other compasses are already more creative than I think I might have imagined myself.